it's a bit of pain to get but oh well. would u know of any other skirts or even short pants or something simular? Medium Bladed leggings is skirt like but looks like metal. That is all there is, well you can wait for magitech armor but its bugged. i do own magitech but i really dont like the "thigh highs"
If you are Norn, their tier 2 medium is a skirt. You can see all the armour skins in-game by going to the bank and selecting the wardrobe tab (3rd option on the left side) and then clicking on each image to preview it. The advantage of doing it this way is you can see all the skins together, and you can see how they'll look on your character. The disadvantage is previewing dye is a pain (although still better than looking at screenshots online where you can't change it at all) and there's no information on how each one is obtained so there's a danger you'll end up finding an outfit which is perfect and then find it's going to take a huge amount of effort (and/or gold) to get. Another option if you want something that looks like light armour is to use an outfit. Of course the problem with those is there is no customisation - it's the full set or nothing, and only 4 dye channels for the whole thing. But it does give you the option of having something totally different to your armour. Dressing up in medium armor is a nightmare, at least if you want something other than robes. Female norn has some nice options with cultural. My female asuran thief, although I love the class, I hardly play nowadays, because I just can't find an armor combination that I find appealing. And I personally hate the whole concept of outfits. True. Medium armor is, for the most part, just variations of a long coat. I really wish they'd work on some other designs. That's never going to happen, they messed up the split between the top and the bottom armor for 99% of the sets and are now just rolling with it. Nah, they're not rolling with it. They're ignoring it and using outfits in place of it. If a regular, form fitting medium shirt for males (Sylvari) doesn't come out, I think I'll always be stuck with my casual hoodie forever. Check the Twilight Arbor dungeon armor. I'm not sure how it is on males but if you are on a female human you can get a very dressy look out of it. Had a guildie use it for an in-game wedding long years ago, before outfits were a thing. There's the Aetherblade medium armor. It's a bit difficult to see from that picture, but the pants are a miniskirt over leggings (the flaps with gears/other metal ornaments are part of the shirt, not the pants). Sadly, the Aetherblade armor is also a gem store item. No idea when it'll be available. Also shorts for male heavy armor please. 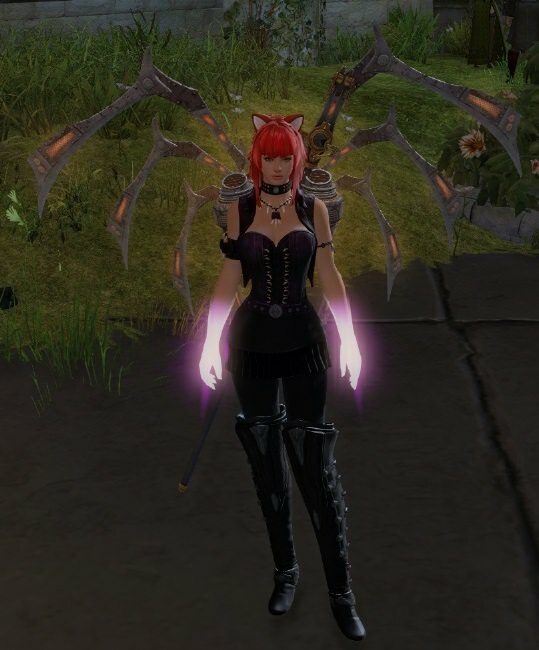 Viper's Boots, Aetherblade Leggings, Krytan Jerkin (all Shadow Purple), Chaos Gloves (a different purple-class dye), Furrocious Cat Ears (various colours), hidden shoulders, Tempered Spinal Blades backpiece, basic Daredevil's Staff (not Bo). if male medium the best you can hope for is pants.